Homeopathic remedies are made from plants, but they also come from some of the foods we eat. 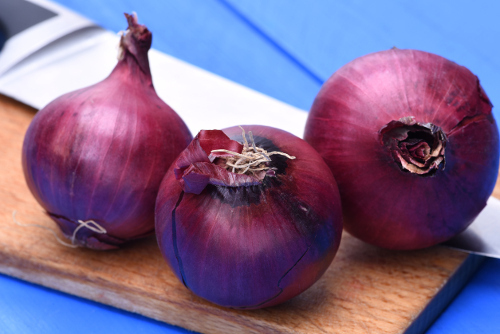 Perhaps the most well-known, food-based homeopathic remedy is made from the common red onion and is called Allium cepa. The onion, also called the common onion or bulb onion, is the most cultivated species of the Allium genus, and it is related to the leek, garlic, and shallot. Like its other Allium family members, onions contain important health-promoting sulfur phytonutrients, such as allyl propyl sulfoxides. As a result, eating onions help boost immunity, treat infections, lower cholesterol, reduce blood pressure, reduce the risk of heart disease, and maintain blood sugar levels. On the other hand, the homeopathic onion, Allium cepa, is used for a wide variety of infections, cold symptoms, allergies, eye irritations, and neuralgic pains. Read on to learn more about the origin of homeopathic Allium cepa, along with its many health benefits and uses. The onion plant has an interesting history and has been grown and cultivated for about 7,000 years. It is a biennial plant but is often grown annually. As food items, onions are cooked as a vegetable, and often part of savory dishes like stir-fries or soups. They can also be eaten raw and added to salads, or used to make chutneys or pickles. Ancient records of using onions date back to Eastern and Western Asia. For thousands of years, onions have been used as food in Persia, China, and Egypt. Ancient Egyptians had such high praise for onions that they were used as currency to pay workers that built pyramids. Onions also had great spiritual significance and were placed in tombs of the pharaohs to accompany them into the afterlife. The ancient Greeks also had high regard for onions and consumed them in large amounts. The first European settlers brought onions to North America; however, the Native Americans were already eating wild onions cooked or raw in many of their dishes. Besides largely being used for cooking, onions were also valued for their therapeutic properties, such as being a decongestant, anti-inflammatory, expectorant, antibiotic, and diuretic. In the Middle Ages, the potent aroma of onions was thought to prevent infections. People would even dangle onions outside their homes to keep the plague at bay. Onions are pungent, and traditionally, when chopped, its chemical substances will irritate the eyes and nose and cause them to water. In homeopathy, Allium cepa is used to treat conditions that cause the same reaction in the body, including mucous membrane problems of the eyes and nose, such as the flu or common cold. In 1847, German physician Dr. Constantine Hering would be the first to prove the onion to work as a homeopathic remedy. Since that point, Allium cepa has gone on to also treat throat and chest infections, headaches, and neuralgic pains. Dull thinking, sleepiness, difficulty concentrating, anxiety, and fear of pain are also common trademarks of the person that responds well to Allium cepa. Other than that, there are no marked emotional symptoms indicative of Allium cepa. People that require the remedy will often crave onions, and feel well when they consume them. The person also has a great appetite and thirst; however, salads and cucumbers disturb their digestion. Health problems associated with homeopathic Allium cepa will often occur when the person is exposed to cold weather or moist wind. The following is further detail regarding the key health benefits of Allium cepa. Allium cepa is often recommended for allergies or allergic rhinitis—also called hay fever. A study published in the journal Systematic Reviews in 2014 suggested that Allium cepa should be used based on clinical indications that match allergic rhinitis. Common symptoms include watery eyes, a stuffy nose, sneezing, and a sore throat. Allium cepa is useful for acute allergy symptoms, especially hay fever with profuse watering of the eyes, and catarrh that irritates and inflames the upper lip and nostrils. Symptoms improve from fresh air and a cool room but worsen from cold or damp weather, and warm rooms. Let’s look a little deeper on how Allium cepa helps a stuffy nose and catarrh. The homeopathic remedy is when profuse and watery catarrh also burns the skin of the nose and upper lip. The nose and lip will become raw, red, and very painful. The nose also drips like a faucet, and congestion will alternate between one nostril or both. The person will also experience constant violent sneezing. Catarrh, a stuffy nose, and violent sneezing are also common symptoms of colds and the flu. As a result, Allium cepa is great for infections of all kinds, especially colds, the flu, and chest and throat infections. Allium cepa is also an appropriate remedy for sore throats, laryngitis, bronchitis, and a hacking cough that settles in the chest area. People will have a sensation where the larynx is torn and split due to pain when they speak. Coughing worsens while inside in warm rooms, and during the night. Symptoms can also be brought on by cold air exposure. Eye irritation is common for people that require Allium cepa. The eyes burn and will worsen from coughing. The eyes are also sensitive to light and are itchy and red. The person will also often want to rub their eyes, which will lead to further irritation. Vision will be impaired where near objects appear to be far away. Neuralgia is a burning, stabbing, and quite often a severe pain that occurs due to a damaged nerve. The damaged nerve commonly occurs in the neck and face. Allium cepa is an excellent remedy for neuralgic pains that are accompanied by a burning and piercing pain that will shift from one side of the body to another. The pain may originate with a toothache in the molars, an earache, or a headache at the back of the brow. The remedy is also given to people that endure phantom limb pains after an amputation. The pain will mainly occur in the face, head, teeth, sinuses, chest, or neck. Like onions, you can purchase homeopathic Allium cepa at most health food stores, but in the supplement section. Allium cepa comes in liquid or pellet form. It is best to consult a qualified homeopath to help determine if Allium cepa is the right remedy for you based on your symptoms. In general, the best dose is one pellet or five liquid drops, every 15 minutes to four hours. When you notice improvement, stop the remedy, and repeat the dose if symptoms return. If there is no improvement after three doses, seek guidance from a homeopath. Chronic or frequent complaints may require a different dosage protocol and are therefore best managed with a homeopath for best results. Lockie, A., Encyclopedia of Homeopathy: The Definitive Home Reference Guide to Homeopathic Remedies and Treatments for Common Ailments (New York: DK Publishing, Inc., 2000), 34, 207, 224-225. Hershoff, A., Homeopathic Remedies: A Quick and Easy Guide to Common Disorders and Their Homeopathic Treatments (New York: Penguin Putnam Inc., 1999), 129, 173, 265. “Allium cepa,” IvyRose Holistic Health; http://www.ivyroses.com/Define/Allium_cepa, last accessed May 29, 2017. Grimes, M., “Red Onion: ALLIUM CEPA Homeopathic Remedy for Flu, Allergies, Sore Throats, and Arthritis,” Natural News Blogs, February 13, 2015; http://www.naturalnewsblogs.com/red-onion-allium-cepa-homeopathic-remedy-flu-allergies-sore-throats-arthritis/, last accessed May 29, 2017. “Know Your Remedies: Allium cepa (All-c.),” Homeopathy Plus; http://homeopathyplus.com/know-your-remedies-allium-cepa-all-c/, last accessed May 29, 2017. Banerjee, K., et al., “Homeopathy for allergic rhinitis: protocol for a systematic review,” Systematic Reviews, 2014; 3: 59, doi: 10.1186/2046-4053-3-59. “Homeopathy Allium Cepa Onion,” Herbs2000; http://www.herbs2000.com/homeopathy/allium_cepa.htm, last accessed May 29, 2017.